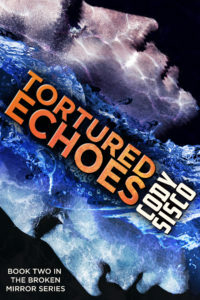 TORTURED ECHOES BY SCI-FI AUTHOR CODY SISCO CONTINUES THE RESONANT EARTH SAGA THAT BEGAN IN BROKEN MIRROR. In Tortured Echoes, Victor Eastmore must face his worst nightmare, Mirror Resonance Syndrome “patient zero” Samuel Miller, the man responsible for the Carmichael Massacre. Continuing to mix elements of alternate history, cyberpunk, and detective noir, Sisco makes genre conventions his own. Tortured Echoes conveys a dark vision by showing how the consequences of the Eastmores’ choices come back to haunt them. Tortured Echoes: Resonant Earth Volume 2 is available in both digital and print formats from Amazon. The first novel in the Resonant Earth series, Broken Mirror, tells the story of a mentally ill young man, Victor Eastmore who believes his grandfather was murdered. As Victor investigates, he begins to question his own mental state as well as the system of treatment that keeps him one misstep away from institutionalization. In the sequel, Tortured Echoes, a character who was offstage comes to the fore: Samuel Miller. Samuel killed hundreds of people during a massacre in a small town in Semiautonomous California two decades before the start of the novel—a massacre that Victor lived through as a child. Samuel Miller is also the original “patient zero” for Mirror Resonance Syndrome (MRS). Victor must confront Samuel and help him manage his condition in order to uncover the truth behind Victor’s grandfather’s death. Readers may also enjoy the short story prequel to the Resonant Earth saga, Believe and Live, which tells the story of what happened in Carmichael from the perspective of Mía Barrias, a survivor.